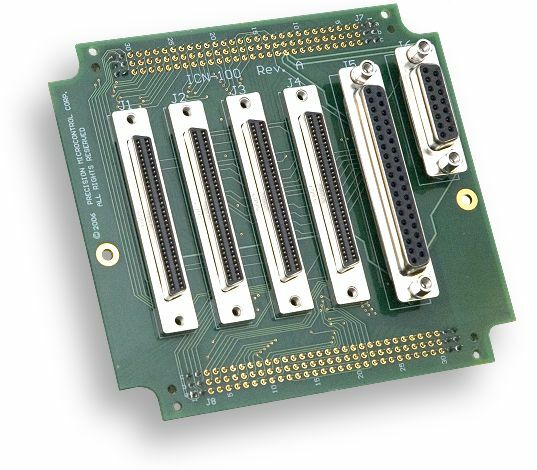 ICN-100 - SCSI Interconnection Board: Plugs onto a MultiFlex ETH 1000 series Ethernet motion controller and features four industry-standard HD68 high-density SCSI connectors that are 100% pin-compatible with the SCSI connectors on PMC's MultiFlex PCI series controllers. 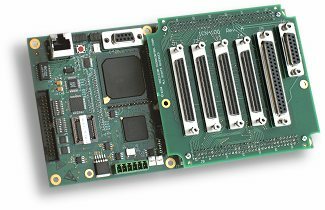 The ICN-100 is ideal for bench-top prototyping and for users of PMC's MultiFlex PCI Series motion controllers. Additional 37-pin and 15-pin D-sub connectors provide an alternative means of accessing the 32 general-purpose digital TTL I/O and 8 optional analog inputs.